Edwin M. Bridges is Professor Emeritus, Stanford University, and has an extensive background in higher education. Prior to joining the Stanford University faculty in 1974, he taught at Washington University (St. Louis), The University of Chicago and University of California (Santa Barbara). He is internationally known for his work on problem based learning and has worked with faculty from a variety of disciplines in China and the Unites States. During his thirty-five year career in higher education, he has consulted with numerous organizations, including the World Health Organization, the World Bank, and the New York City Public Schools. Professor Bridges has received two lifetime achievement awards for his contributions of the field of educational administration and is listed in Who’s Who in America and Who’s Who in the World. At the age of twenty-six, he was appointed a high school principal; the following year he was chosen as one of three Outstanding Young Men of Indiana. Since retiring in 1999, Ed lives with his wife Marjorie, in an historic home on the Stanford University Campus. Three years ago, they celebrated their Golden Wedding Anniversary. 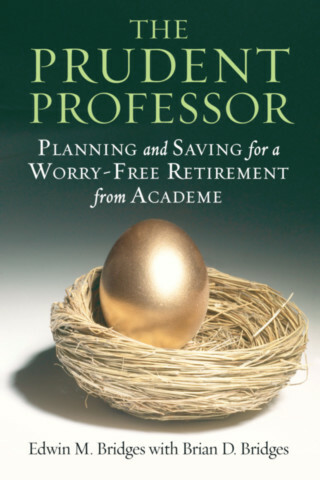 In retirement, he has devoted much of his time to activities that he neglected during his career as a professor – investing and retirement planning. After reading hundreds of books and articles on these subjects, he decided to share the lessons he learned with friends, colleagues, family, former students and others through his writing and public speaking. He brings these lessons to life by drawing on his personal setbacks, mistakes, and triumphs in investing and planning for retirement.